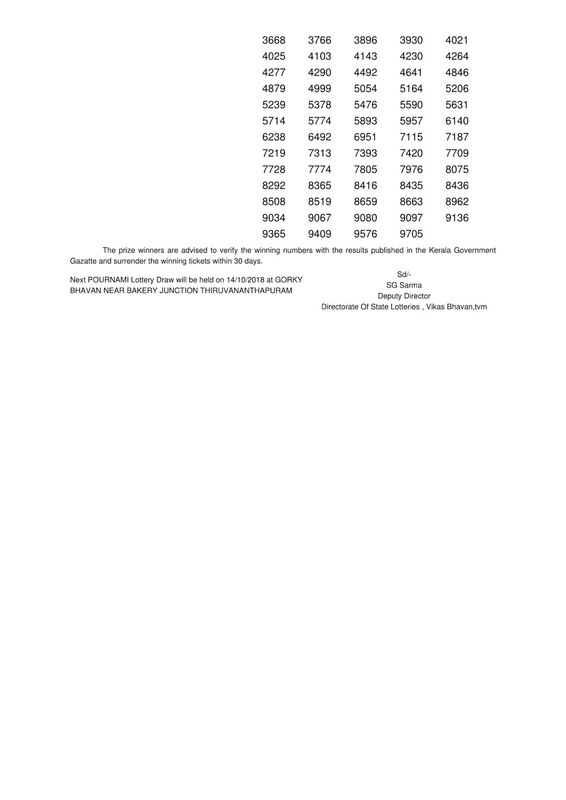 Kerala lottery result on 07/10/2018 of Pournami (RN-360) lottery published below. 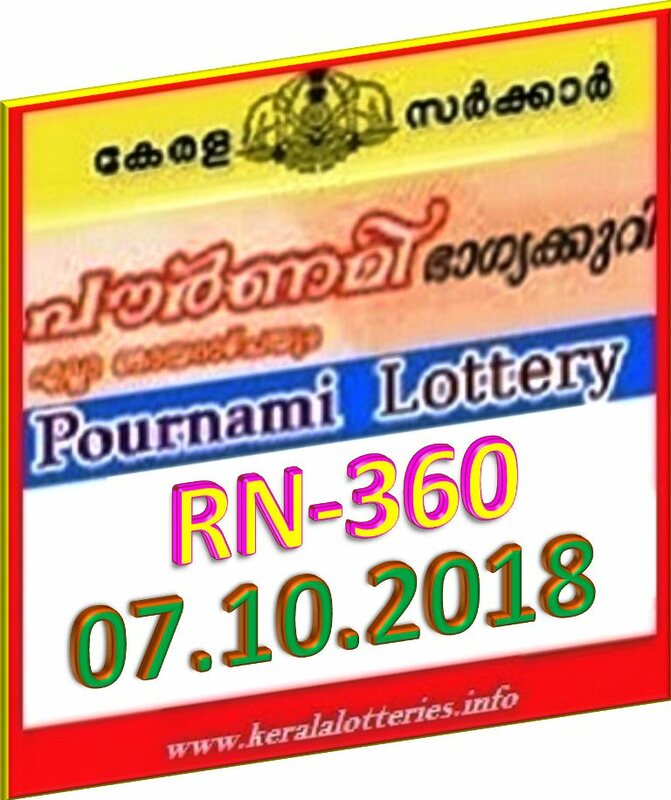 Today's (07 October 2018 ) Pournami RN-360 lottery draw is held by Kerala lottery department at Sree Chithira Auditorium, Pazhavangadi, East fort, Thiruvananthapuram. The draw of Pournami RN-360 lottery starts at 3 PM Live results are expected from 3:03 PM and Official result is published here by 4:00 PM. Pournami RN-360 lottery price is Rs.30/- and the first prize given is Rs.50 Lakh. Rs.14,96,15,000 is to be provided as prize money through 2,26,814 prizes. 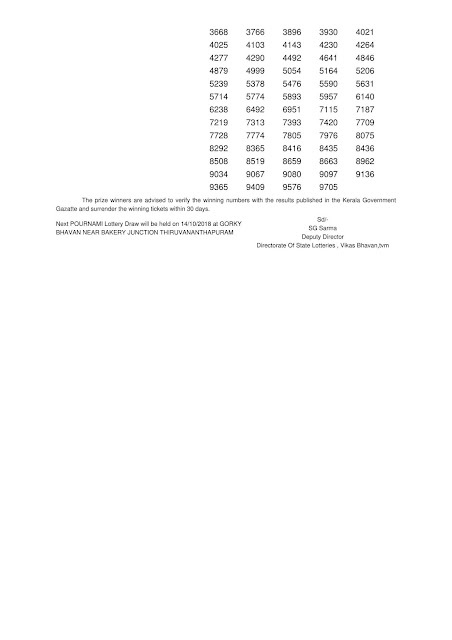 Have a look in the details of Pournami Lottery. 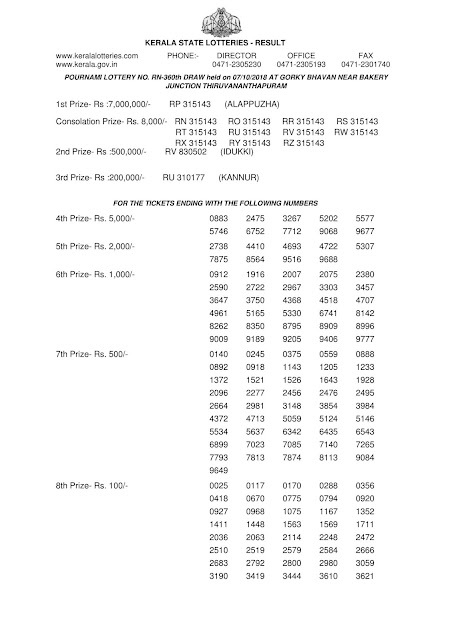 First prize of Kerala lottery Pournami RN-360 offers a first prize of Rs.50 lakh, one second prize of Rs.5 lakh and one third prize of Rs.2 lakh. The lower tier prizes start from the 4th prize of 5000/- and ends with 8th prize of Rs.100/-. 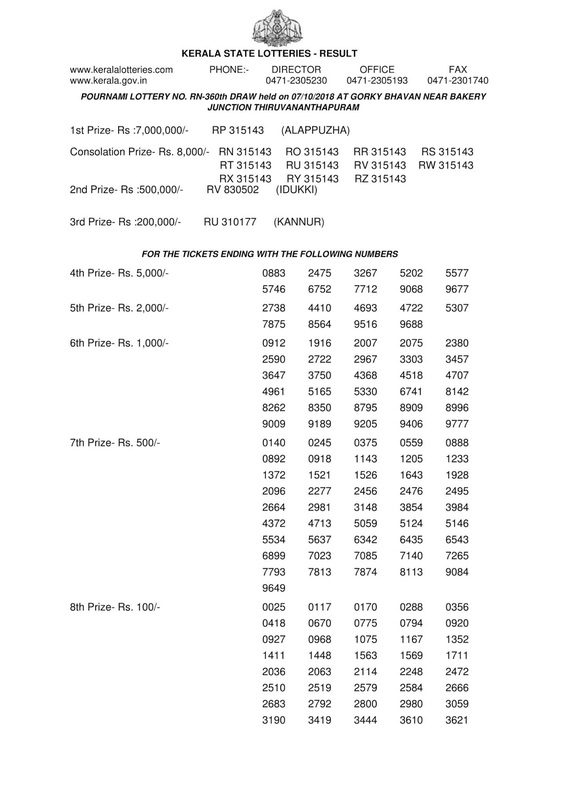 Lower slab prizes of pournami-rn-360 are given to the last matching 4 digits. Today's lottery pournami-rn-360 is printed in twelve series for sale. The lottery tickets of rn-360 pournami are drawn on every Sunday. Kerala pournami bhagyakkuriyude phalam. Live result and Official result of Pournami RN-360 lottery result on 07-10-2018. Win Win (W-481) lottery draw will be held on tomorrow (08-10-2018) Monday at 3 PM and the result will be published by 4:00 PM. Next Pournami (RN-361) lottery draw will be held on 14/10/2018; Sunday at 3:00 PM.